Florida summers are hot, humid, wet and muggy. This ecosystem is perfect for Chinch bugs to thrive in. Chinch bugs kill a lawn fast. Learn how to spot and prevent this elusive bug. In chinch bug treatment and prevention, it is helpful to maintain a healthy lawn. Dry grass with heavy thatch is often attractive to these insects. A healthy lawn can better fend off an infestation of chinch bugs and other pests and lawn disease. A healthy lawn will also respond better to insecticide treatments. Keep lawns well-watered, especially during hot summer months. Mow lawns at the recommended maximum height. Regular feedings provide the nutrients your lawn and gardens need to grow strong to protect themselves from insect damage better. Identify and control the problem early. Grass attacked by chinch bugs looks like grass suffering from drought. One way to tell if you have chinch bugs and not drought is if the grass does not green up after it has been watered. If your lawn remains dead, you might have chinch bugs. In large populations, you can often smell them when you walk across the infected area. Chinch bugs are easy to recognize but hard to see. They're about 1/5-inch-long with black bodies and white wings folded across their backs. It takes chinch bugs about four to six weeks to mature. They kill the grass by their feeding and injecting a toxin into the leaf causing the leaf to turn yellow-brown and then turn paper bag brown and die to leave large dead patches as grass dies. These patches often begin on the edges of lawns and will continue to get larger. Both adult insects and their nymphs cause turf destruction. And both have that characteristic unpleasant stench when crushed. Chinch bugs thrive in the southern United States and prefer St. Augustine and zoysia grasses. The pests are most active in late June through early September. 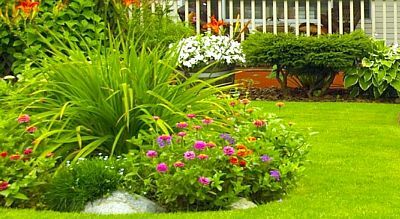 Damage typically occurs in the sunniest areas of your lawn, especially when the weather is hot or dry. For a surefire diagnosis, sink a can with the bottom cut off into the turf several inches deep. Fill the can with water and watch the chinch bugs float to the surface. If you count 20 to 30 chinch bugs in lawns at any instar, you will need to take steps for control. First, check the irrigation and repair as needed and then apply a suitable insecticide to the whole area. Don't be surprised if the dead areas don't grow after right away treatment - Even though the chinch bug is dead - their toxin lives on and takes days to kill. Non-toxic applications of horticultural soap or using natural chemicals, such as pyrethrin's, may achieve some control. In extreme cases, you may have to resort to any number of turf insecticides, but be cautious, as these can harm beneficial insects like bees. Follow all directions and keep children and pests out of the area until it has dried. 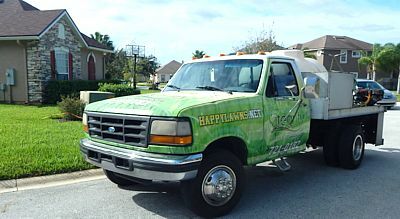 The best advice is getting a good lawn spraying company. Ease- We take care of your lawn, so you don't have to. 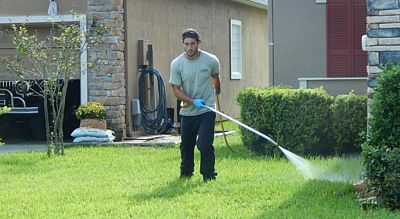 Experience- We have over 14 years of experience dealing with lawns. 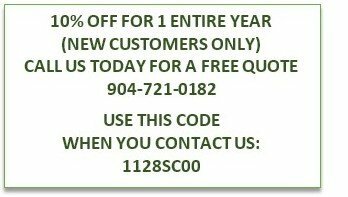 Great prices- As a local company, we pride ourselves in our fair and competitive pricing.